Everyone here at MAK Couriers is celebrating. We’ve just scooped a national industry award that recognises its achievements in courier services over the past twelve months. We won the Company of the Year category at the Annual Transport Awards 2015 for our local and nationwide same-day delivery business. The Transport Awards, now in its thirteenth year, organised by Transport Exchange Group,the operator of the largest and fastest-growing freight exchanges within the UK and Ireland. The awards ceremony celebrates the achievements amongst more than 3,500 couriers, owner drivers, hauliers, freight forwarders and logistics providers that are trading over 700,000 loads annually via the platform. Tony McAndrew from One Insurance Solution presented the award to MAK Couriers’ MD Kam Sandhar at the annual ceremony that took place at St John’s Hotel in Solihull, West Midlands, in front of more than 300 industry leaders and professionals from across the UK, Ireland and mainland Europe. 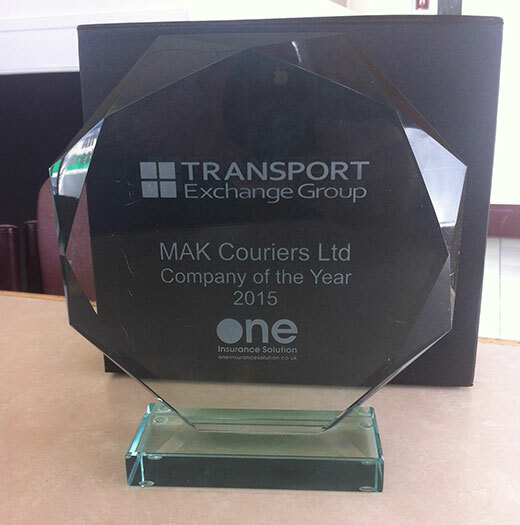 The company was one of four winners that were nominated and voted for by more than 3,500 members of Courier Exchange and Haulage Exchange in recognition of their major success and best practice in terms of customer service, operational performance and delivery.